My friend and her fiancé regularly make the 10-hour drive from D.C. to her house in Nantucket for the weekend. I get it–the gorgeous beaches, the charming town, Cisco brewery, and access to arguably some of the best seafood on the East coast, justify the road trip in the time it could take to fly to Italy. But, thanks to The Salt Line opening she can save some gas. 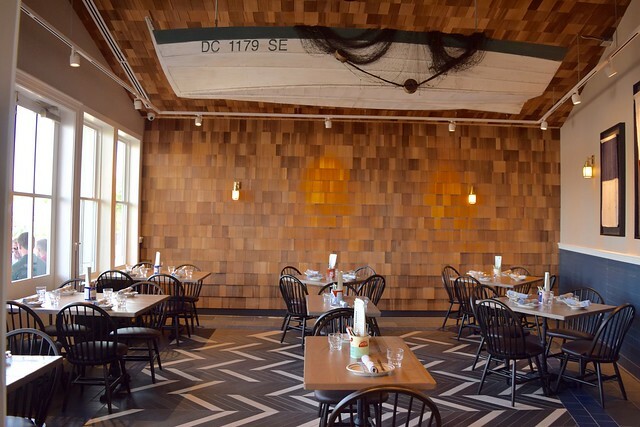 The highly anticipated New England style restaurant by Paul Holder and his Georgetown crew recently opened across the street from Nationals Park, on the Anacostia River. With mint green chairs, tan shingles, and a gorgeous wrap-around outdoor bar, the space has completely transformed the corner ground level of the apartment complex in which it resides into a New England seaside oasis in the center of a riverfront warehouse district. 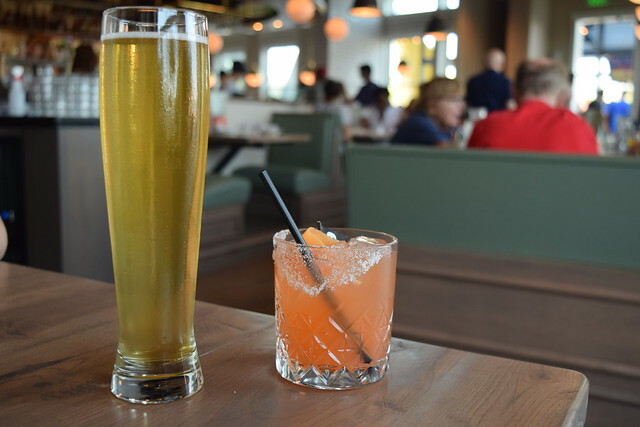 You won’t be able to find mimosas and brunch items until this fall, but if you are looking for a pre-or post-game drink, the Salt Line is your place to meet. It’s the perfect place for a Del’s Shandy, a lady date of oysters and rosé, or a place to watch the latest sports game, al fresco. 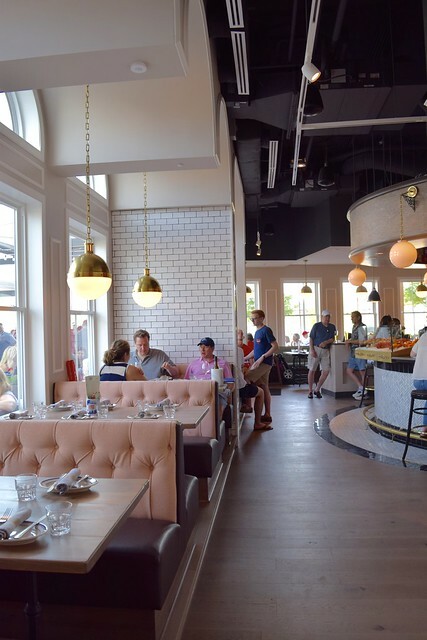 If you’re looking to eat a full meal, head inside past the outdoor hostess stand (grab a salt water taffy on the way) and enter the heavenly interior, with subtle nautical touches, white herringbone and subway tiles everywhere you look, and blush pink tufted booths. I only live a few floors above the restaurant and the decor alone made me want to move in. We came from the Nats game, but we purposely held out on ballpark food knowing we were in for a post-game treat. 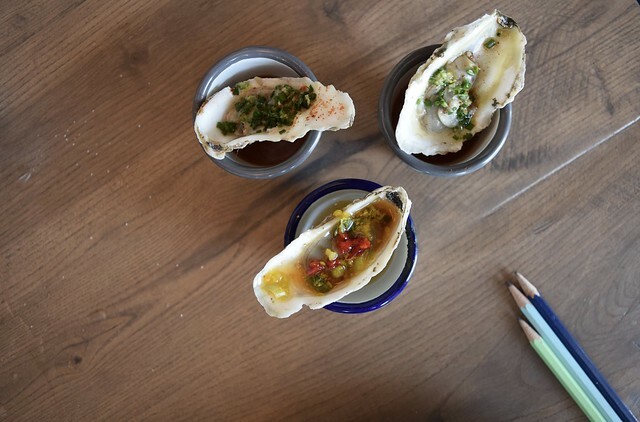 We started with a few shared plates and a half a dozen fresh oysters–you select your oysters with cheeky pencils and paper menus, similar to a sushi restaurant, stored on each table in vintage-looking oyster cans. The cocktail and wine (read: rosé) list is extensive, but we stuck to a refreshing Cisco brew (because, Nantucket), the saltier dog (grapefruit and vodka), and a cider. All of our drinks hit the spot on the first 90 degree day of summer. 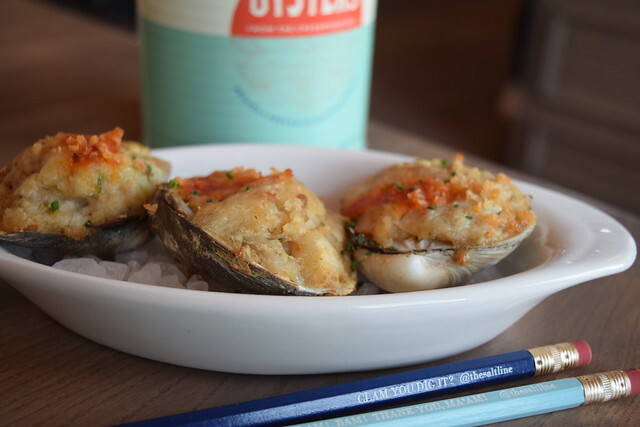 The Stuffies are Chef Bailey’s take on clams casino. Frankly, we came for apps and drinks earlier in the week, devoured the dish, and even contemplated placing another order. The clams, breadcrumbs, and greasy sausage was a divine combination. But, these were a little dry and just felt like they were missing something, perhaps the sausage? Fewer breadcrumbs would have been desirable. However, you can’t beat the price tag of three stuffies for $8. The cod fritters came out in a perfect portion for the three of us. They were simply served on Saltines with a dollop of mustard and only required a few bites. 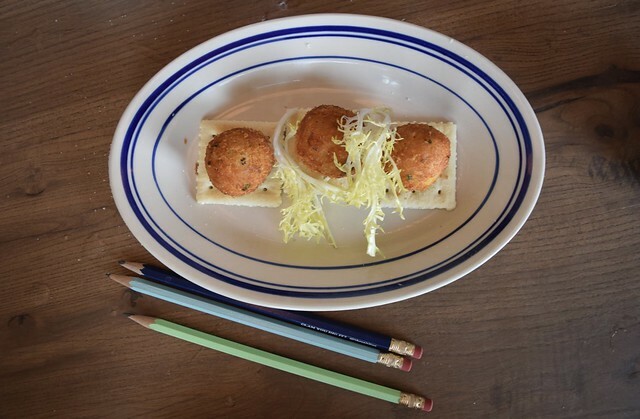 They weren’t the most flavorful appetizer we sampled, but we’d order them again, nonetheless. Our oysters came out fresh and with an accompanying mignotte. 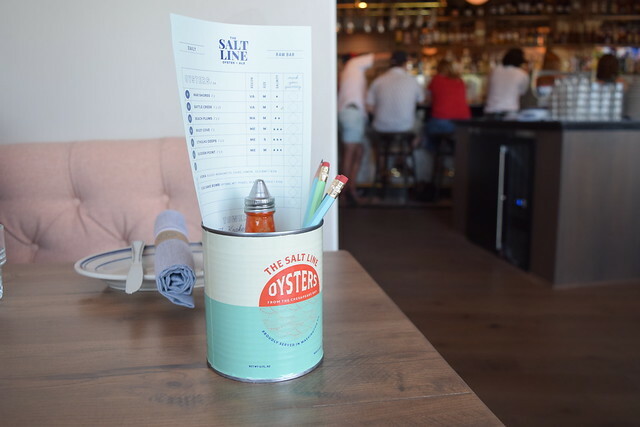 Salt Line is a part of the sustainable fishing cooperative Dock to Dish, which connects small-scale fisheries to regional chefs, so the selection rotates daily. Always with the head on a swivel, we saw oyster shooters go by and decided to be spontaneous and shoot a few back. The two flavors–Bloody Mary and sake–were delicious, but shooting them certainly was not our best look. Soft shell crabs can be tricky, to eat and to serve. One of us decided to see what the Nashville hot soft-shell crab sandwich was all about, while the rest of us were jonesing for a lobster roll from the minute we woke up that morning. We ordered one dressed and one buttered. 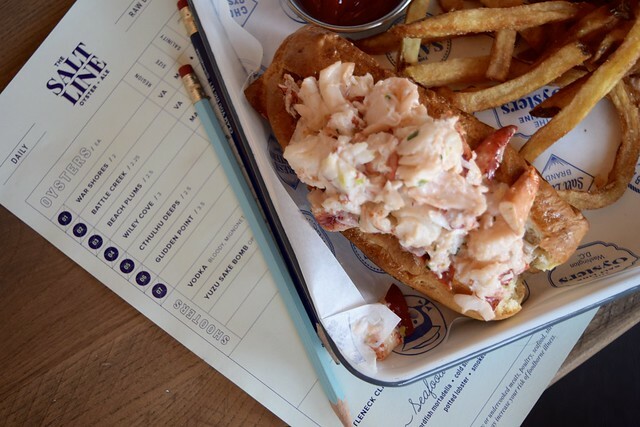 You really can’t go wrong with either–they are served in perfectly authentic, crispy, buttered hot dog buns, but the buttered version of the fresh seafood salad happened to be more flavorful. Props to Chef for the creative take on combining a traditional fried chicken sandwich with soft shell crabs. It was flavorful, not too messy, and paired so well with the pickled green tomato and herb mayo. Not to mention, the bread held everything together and wasn’t flimsy serving no purpose. 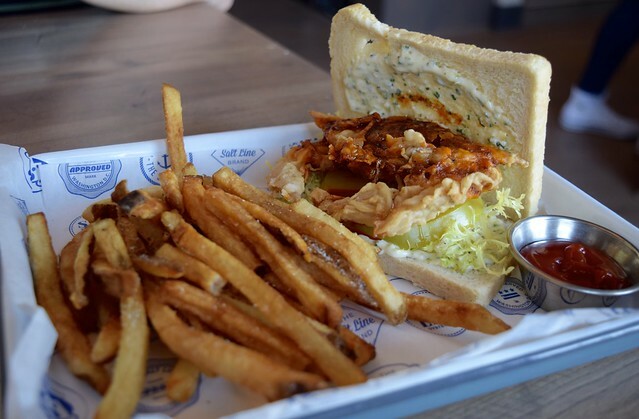 For anyone who’s hesitant about soft shell crab, this sammie is a great option. Moving on. 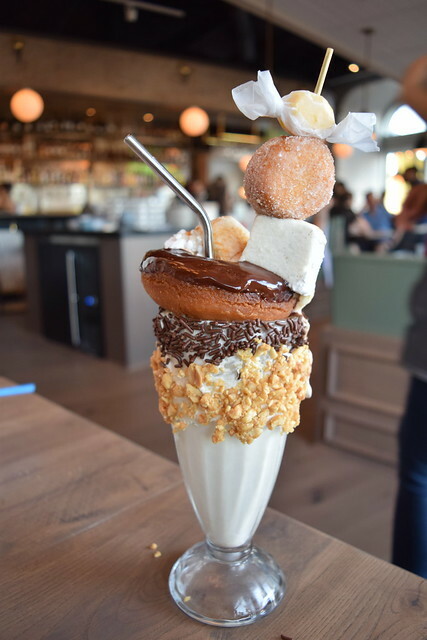 The Fluffernutter milkshake was simply epic and arrived like a damn Christmas tree of summer treats, including a chocolate covered doughnut, ice cream from local Ice Cream Jubilee, chocolate sprinkles, handmade marshmallows, and a piece of saltwater taffy, which really made this Jersey girls heart aflutter. Once you actually get to the milkshake your eyes will roll back in your head as you sip from the cold, vintage steel straw. And we didn’t expect anything less from Tiffany at Buttercream Bakeshop, Chef’s wife and the pastry chef behind the delicious desserts offered at Salt Line. Next time, we’ll be back for the blueberry ice box cake–and of course, brunch.